Thanks John - I thought it might be something like that. So that means the tidal effects are reduced or eliminated? Typically with a single gate it would open about an hour before high tide and close similarly after the tide, so within the dock there is a minimal tidal effect. Usually this would open direct to the sea, however up a river a port such as Sharpness on the R. Severn has two gates just like on a canal as the river is tidal, and so the water level will be constant. In the lower left is a drawbridge that I've partially built and the abutments are 50mm from the base to the railhead. That would make the water 12'6" in OO and 14'3" in HO below the dock. Of course, after I pour the water, depending on the method I use, I could lose a few millimeters. Then when I build the ships I'll adjust the hull depth to make it look right. ...Judging by your plan you could quite comfortably fit in a 150ft freighter, which is pretty big for the Rev Awdry's era. Or a couple of schooners. Assuming a lock then your quay needn't be higher than 10ft. How big do you think freighters would be here? I was thinking around 90 feet. I also have a small steam tug I'll be fitting into the scene. As you can see from the pic of Nijenstein, 90 ft or even a tad smaller if you needed would be OK for a small coaster plying between England and Isle of Man. This would be fairly typical of the era. Although you might want to base it on available space left after your tug. As a rule of thumb a ratio of 8:1 would approximate length to beam. I had a brain fart and gave you some mis information. A warship's profile is 8:1, a merchantman is closer to 5:1. The lesser profile gives them greater speed per HP, just like a whippet. 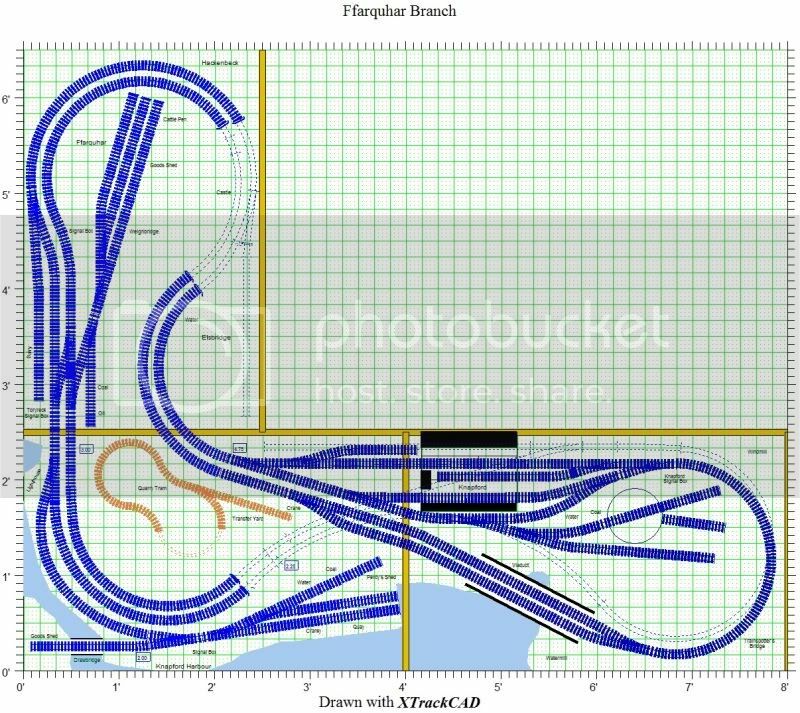 When I inventoried the number of points I had available from the old layout I discovered I had a few left over. So I made some changes. First I added a passing siding (not sure what the British term for that is) on the viaduct. I wanted a double track there for the visual aspect. I figured I could park a work train there if I felt the need. I added a second staging track below Knapford Station - it's hard to see, but trust me, it's there. It's attached to the hidden return loop. I relocated the engine yard to give more room for shops and such in Knapford. I added a short storage track next to Knapford Station. Though it's on the wrong side of the station, it will be the track where passenger engines rest between runs. In the TV show that's usually Gordon, but my layout isn't big enough for Gordon, so in my case it will be James.